The 'study of', 'specialty in' or 'art of' digital strategy, design and technology. There's no denying that social media marketing is hot, very hot. It's also very easy to see why, just take a look at the above numbers. In order to engage with your customer you have to go to where they are and, as the above stats show, they are on the social platforms. Great, with this information in mind let's set up a Facebook page and proceed to post the odd bit of news and a few pictures of kittens….erm no. Instead, let's have a talk through getting real value from social media - by developing a social media strategy. This is an incredibly important step if you wish to run a successful campaign. Many businesses end up doing social media with no real reason, often seeming extremely busy whilst not actually making any progress toward their business goals. The business objective will form the path for your social media marketing campaign. This is important as there are some very important things to remember when setting your goals; you need to be realistic, you will not have one million likes on Facebook unless you are a multinational company or have the hottest product on the market since records began; you need to make it measurable, use numbers as it's much easier to mark against a goal of six hundred Twitter followers than increase Twitter followers; and you need to make it medium to long term, social media takes time to implement and it is extremely rare for it to become an overnight success for most companies. Everything you do should be built on what you know and learn about your audience. Start by painting a picture of your audience, creating personas is a great way to do this. You then want to dig into the facts about your target customers to reveal the insights. These facts and insights will give your social media marketing a clear tone of voice and direction, whilst understanding how your clients feel about your services and the way they wish to be treated. A strong brand and a cohesive story will set you apart from your competitors. Develop a story that provokes your audience into having an emotive reaction. What is the history of your brand? What does your brand aspire to be? What makes your brand unique? - Answering these kind of questions will help to develop your story. You will learn a lot by simply reviewing the activity of the competition and others in your industry. Discovering and understanding what your competition is already doing will help you identify and leverage ideas that are working and find gaps that you can take advantage of. Pick three competitors and conduct an audit. Don't just look at their social media accounts, check out their website and their performance in search as well. Look to see if they tell a cohesive story across all of their digital channels. Learning as much as you can about your competitors is an essential step to developing a social media strategy. Once you have done this take a look at what the main barriers are that you will need to overcome to be successful. For example you may be selling flux capacitors, but due to the complex nature of them your potential clients may be put off. Use your social media platforms to provide information and knowledge to help your clients' understanding. The more they understand the higher the chance of them buying your flux capacitors! This stage is all about expanding your client base and you have three different options to do so. You don't have to stick to just one option though; you can treat it like a good salad and mix it up! The first option is bringing in new clients who have previously not had any need or use of your product or service. This will increase your market size without gaining any existing customers from your competition. Your second choice is to win clients over from your competition. What a better way to make money than by taking it out of the pockets of your competitors? This can have a knock on effect; if potential clients as outlined in option one see you winning more and more market share then they will be more likely to use you as a service provider rather than your competitors. And behind door number three we have the option to upsell to your clients, which is if they buy bananas from you get them to buy oranges as well. Getting more out of existing clients is a two way street though as they will expect more from you too! Amazon's "Customers Who Bought This Item Also Bought" bar is a great example of this. At this point look back at your key barriers in Stage 4 and decide on your marketing objective(s). This should be in direct relation to those barriers i.e. if your issue is low awareness, then an objective should be increase awareness. What role will social media play in helping you reach your marketing objective? Now that you have gone through your processes and understand the goals you are aiming to achieve it is time to turn our attention to undoubtedly one of the most important aspects of social media marketing, the three headed giant that is content creation. For ease of reference I'll break it down into its three key components. Brand Awareness & Trust: "I'm aware of your brand and I trust and respect it." These are great words to hear a customer say and the goal here is to at the very least have them thinking this in their subconscious. Engagement, Connection & Consideration: "I'm aware of and understand the different services and products you offer." A key driver here towards successful conversions, clients are a lot less likely to part with their hard earned salaries if they do not understand what exactly it is you are trying to sell them. Conversions & Sales: "I'm going to purchase your product/service." Great news! This is the end goal for the majority of businesses; however note that a conversion does not necessarily need to mean a cash transaction. If I host a website offering free games then I would count it as a conversion each time someone visited the site and played a game of pool etc. Similarly for your business your conversion goal may purely be to enhance your brand reputation through social media rather than have five thousand orders for your new potato powered ceiling fan. Deciding which of the three you are aiming for at a given time is key to considering what content you are going to create and share with the world. Again, as it normally is, it is most common for there to be a mixture of the three. To end any Harry Potter jokes now, 9 and ¾ is not an option here, however the vast list of social media platforms now available on the web can be a little bit daunting if you aren't overly experienced in using it. From your goliaths like Facebook and Twitter to hot up-and-coming platforms like Pheed there is a purpose and correct use of each one. That being said, the basis we recommend for every campaign is to include a blog page on your company website. Having your own blog, which you are fully in control of, is an amazing foundation for creating all of your content and also helps you gain links to your home domain! Not wanting to go overboard on details here, the top eight social media platforms circulating at the moment are, in no particular order: Your own blog (we've been a bit flexible here as it's not completely social media); Facebook; Twitter; LinkedIn; YouTube; Google+; Pinterest; and Instagram. Right, now we have the understanding to be able to produce killer content and host it on the most suitable platform there is still one last point to consider before you swan dive into the world of social media. This is the concept of frequency. For an example straight off the bat let's say you have decided the best way to promote your business is by making a video. Great, videos are a brilliant and effective way to spread messages virally over the Internet, however they take a lot of time to put together correctly and normally cost quite a bit more than most other content. Frequency wise it would be a bit risky to say let's do a video campaign for the next 6 months and post a new video every day. Firstly that's a lot of hours and cost spent putting together one hundred and eighty two videos. Secondly unless you have a product, which is the best thing since oxygen, it may be difficult to post and promote fresh, original and innovative video content every single day. This is a point where the three C's come into play. Create: You produce your own content, maybe an article, a photo or a video. Curate: You share someone else's content, maybe a retweet or a link to someone's blog. Contribute: You reach out and comment on others' post or videos etc. 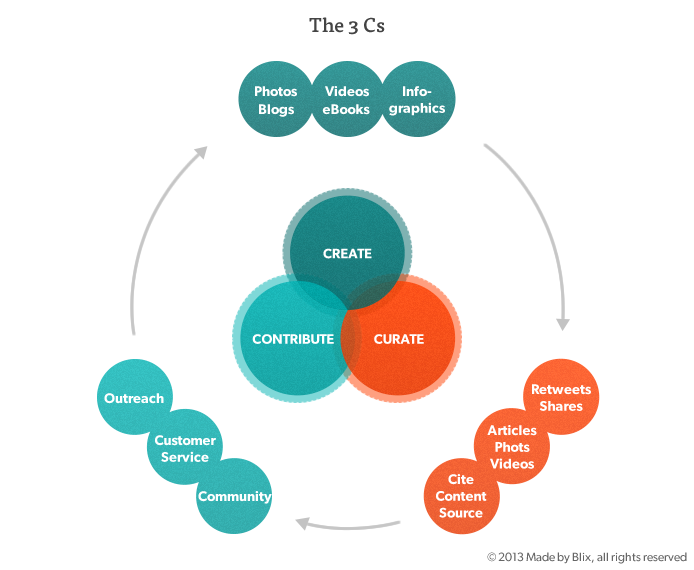 Managing the three C's effectively is a great way to optimise your campaign's efficiency. And now, the end is here and so I face the final curtain my friend. The last stop on the social media express is metrics. Metrics is the art of measuring and evaluating your campaign. Note here however that metrics is not a one time only thing at the end of your campaign. In order to optimise your social media efforts you need to continuously consult your analytics in order to squeeze out the best results possible from your campaign. I won't go into detail on it here as there is a long list of variables to consider in your metrics so we'll write a blog post on it in the next week or two. That's all for now folks, thanks for reading and we hoped you enjoyed it. If you would like a consultation or have any questions you want to fire at us then please feel free to get in touch.